Around this time last year, tag-team partner in fandom Wilma W. and I took part in the rite of passage that dedicated otaku like us engage in every so often when we get tired of looking at our stuff: We packed a bunch of it up and sold it at the Anime Swap Meet at the Blaisdell Exhibition Hall. And it’s neat to browse through the rest of the expo, too … we were across from a retro-gaming booth that had the attract mode music from Super Mario World for the Super Nintendo looping all weekend, and I picked up an oh-so-cute Bellossom plushie from another vendor for only $5. We aren’t going to be making a return appearance as sellers again this year, for various reasons. But there are going to be a number of similarly enthusiastic otaku who will be more than happy to sell you their stuff in our place. This year — the Anime Swap Meet’s third, the Hawaii Collectors Expo’s 27th — promises to be an even bigger party. Artist Audra Furuichi’s kicking off the year for nemu*nemu at the event and will have her usual assortment of merchandise and original drawings for sale, and MidWeek cartoonist/Pepe the Chihuahua kalbi handler Roy Chang will be selling his books and drawing Funko Pop-ified sketches of anyone who wants them. Several artists from Comic Jam Hawaii will be hosting a drawing table for the little kidlets. Replicas of the Ghostbusters Ecto-1 and Jurassic Park Jeep will be on display for photo ops. And, of course, Kawaii Kon representatives will be on hand, although they’ll be selling three-day badges for the upcoming con on Sunday only. 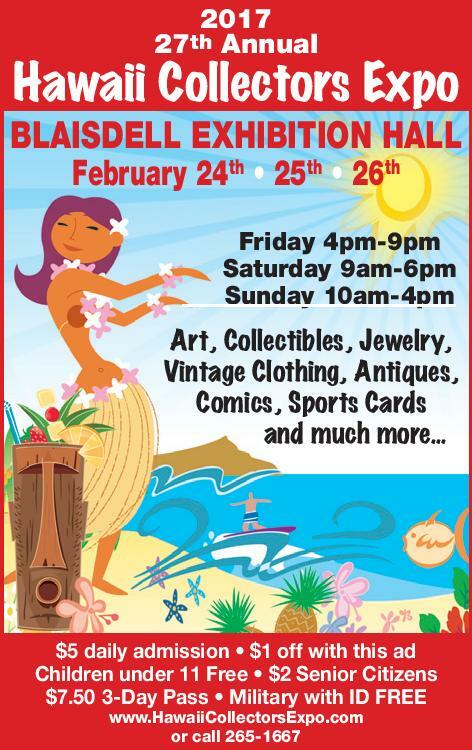 The Hawaii Collectors Expo begins tonight from 4 to 9 p.m. and continues from 9 a.m. to 6 p.m. Saturday and 10 a.m. to 4 p.m. Sunday. The Anime Swap Meet will be open Saturday and Sunday only. Admission is free for children under 11 years old, military with valid ID, or anyone with a Kawaii Kon or Comic Con Honolulu badge from last year; $5 general per day; $7.50 for a three-day pass; or $2 for senior citizens. If you are going to be paying to attend, you can print out this copy of the image above, bring it to the ticket-sellers and save $1. For more information, visit hawaiicollectorsexpo.com.